This Friday there's a perfect excuse to go to Port Douglas (or Port Uglyarse as a unnamed friend of mine insists). There's a fund-raiser for Fun For Life for their 2011 Haiti project, that is working with children in need. There'll be music by Kim Hurley, who you can hear on Port Douglas radio. 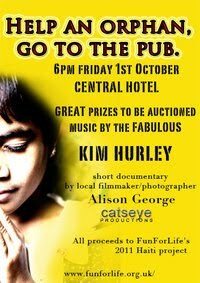 A short documentary on Fun For Life work in Sri Lanka by local filmmaker and photographer Alison George, will also be screened, along with a great prize auction. Roy Weavers from NewsPort has a different take on supporting this Friday's event. "As an orphan myself, I feel it is my duty to go to the pub as often as I responsibly can," says Roy. "And I know how much support I need!" Fun For Life is an educational theatre and arts organisation that empowers young people and their communities, particularly those disadvantaged through sickness, war or poverty, by teaching them vital life skills and inspiring them with a passion for life-long learning.